Malian Tuareg soldiers during a visit by Mali's army chief of staff, Kidal, Mali, July 27, 2013 (AP photo by Rebecca Blackwell). June 20 marked the one-year anniversary of the landmark peace deal struck in Algiers between the government of Mali and separatist Tuareg rebel fighters. 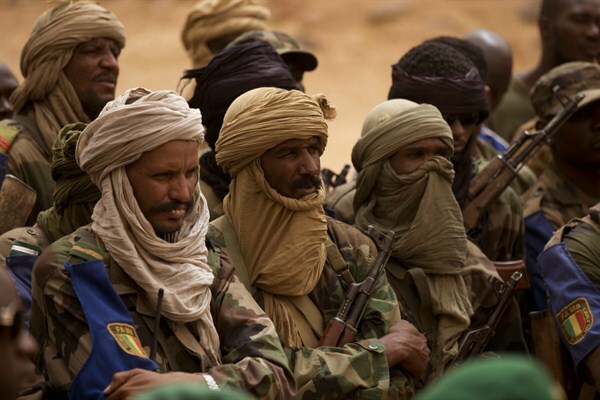 In 2012, the fighters, joined by Islamist militias allied with al-Qaida in the Islamic Maghreb (AQIM), led an uprising against the central government, claiming an independent northern state called Azawad. The Algerian-brokered deal was a bid to put an end to the cycle of rebellions that have tormented northern Mali since the 1960s.